The Pastoral Department reflects the Augustinian insight that the search for God coincides with the search for self. In conjunction with the Theology Department, the Pastoral Department seeks to foster the spiritual, intellectual, emotional and social growth of our students and staff. Pastoral counseling is available to faculty, staff and students who would like to address personal issues concerning faith and spirituality. The Pastoral Team is available throughout the year. Classes for the reception of sacraments are scheduled every other year. Catholic students who have not received Confirmation, Reconciliation or Eucharist are invited to deepen their faith by meeting with a member of the Pastoral Team. Students who are inquiring into the Catholic faith may be baptized after suitable discernment and preparation. 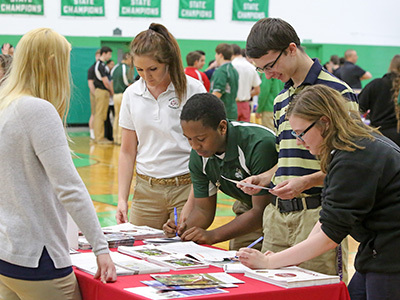 At Providence, potential candidates are identified by faculty members, the Pastoral Director, or the Augustinians and are personally invited to explore the call to serve God and the Church–whether in ordained, professed or lay ministry. Individuals and small groups meet with the Augustinian vocation director for discernment and prayerful discussion about what they will do with their lives. The Providence community gathers to celebrate monthly Masses, highlighting special moments such as the Commissioning of Eucharistic Ministers and the Baccalaureate Ceremony. Other Masses outside of the school day include those for various athletic teams and school groups, the Women’s Club and a celebration of the Arts. 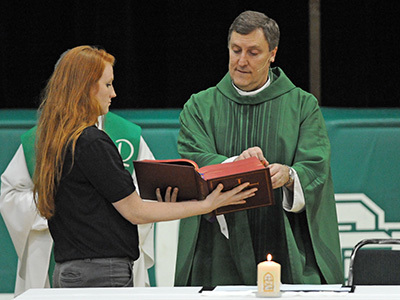 All-school non-Eucharistic liturgies are held for occasions such as the Lenten Reconciliation Service, and induction into the National Honor Society. Daily Liturgy: A Mass is celebrated every morning at 7:25 AM (8:25 AM on block Wednesdays) in the school chapel. This is a beautiful way to begin the day! 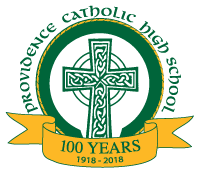 Faculty & Staff Quarterly Masses: The adults of Providence gather four times each year to develop relationships and faith community through the celebration of the liturgy. Preschool Liturgy Program: The youngest members of the Providence family are introduced to Eucharistic liturgy by their teachers and the Pastoral Team. A liturgy is celebrated at the end of the unit, with age-appropriate prayers and songs. Eucharistic Ministers: The Pastoral Department selects faculty, staff and senior students to serve the community as Ministers of the Eucharist. Student ministers serve at daily and all-school Masses. Sacristans & Liturgical Aids: The Pastoral Department trains students to assist at all of the school liturgies and prayer services. A variety of liturgical ministries are available for student participation. Mission Awareness: The students are introduced to gospel themes of social justice and fundamental option for the poor through the weekly mission collection. This collection is distributed to those in need, particularly the Augustinian Missions in Peru, South America. Augustinian Youth Leadership Conference: Students are invited to participate in this annual opportunity to gather with young people from other Augustinian schools and parishes. Participants are introduced to the Augustinian values of truth, community and love within the context of a service project or Augustinian ministry site. 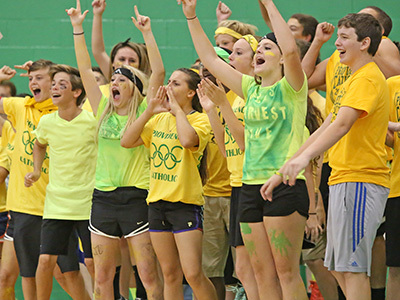 Learn more about student retreats on our Retreats page . Learn more about SAVI and download the interest form on the SAVI page.